Clearly a bunch of dudes who like staring at album artwork and letting their imagination run wild as much as I do, Colorado’s Khemmis are back already after their well-received début of last year. This time, the old wizardly man from that album artwork is on a very barbarian-looking horse and off on an adventure. What’s the adventure? Can he use the big sword and shield he carries? What happened to the barbarian babe in skimpy armour from the last album? These, and other such questions, are what fly through my your head whilst listening to Hunted, a doom album that isn’t afraid to throw a little bit of everything into the mix, often to terrific results. The base sound is Iron Maiden slowed down, a gleefully traditional set of riffs played on a guitar with a lovely, rich, warm tone backed by solid if unremarkable drums and (audible) bass, but Khemmis are open-minded enough to throw in something of doom smorgasbord, so we get both heavy stoner boulder-drops a la High on Fire and goth-tinged melodrama that’s pure My Dying Bride on the opener Above the Water. Dual vocalist/guitarists Phil and Ben mainly stick to the Stainthorpe-gone-stoner plaintive singing, but indulge in some classic growls that for the most part are well-placed enough not to be out of place. Given another album or two it’s easy to see them being dropped altogether, however, as they’re much reduced from the band’s début and honestly the clean vocals are good enough to carry the album on their own. That’s particularly clear once you hear the following Candlelight, perhaps the best track present thanks to a genuinely catchy vocal hook that’s used just sparingly enough to be infectious rather than overblown. The verses fall into the same vocal rhythm, not so much trancelike as hymnal, and the dip into funeral doom several minutes in is perfectly judged to grip the listener, as is the epic return to clean singing thereafter. Yet all the songwriting present is terrific, the rumbling rocking and epic heavy metal contrasts of Three Gates as good as the post-rock dalliances of Beyond the Door, the latter also exploring those My Dying Bride and even Candlemass influences a little further to terrific effect. Call me controversial, but I feel like the band are better when working with set song boundaries too; the twelve-minute finale title track should be terrific, but falls a little short for me. The opening has a nice swing to it, and the ensuing guitar worship is charming enough; even if you don’t quite fall in love with the band, it’s easy to admit that their heart and soul are in the right place. At nine minutes in there’s a shift towards atmospheric doom that doesn’t quite work, however, feeling like a skippable album outro rather than a vital section of the song. I feel slightly ridiculous typing that though, as it’s hardly bad, and is the precursor to perhaps the most convincing My Dying Bride tribute on the album, epic riffs and vocals working together perfectly to draw a very good album to a close. Let’s wait a little longer before throwing too many accolades at the band, however; I’m not quite sure that this is album of the year material yet. 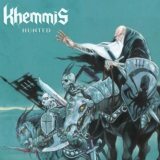 The range of influences that Khemmis has to draw on are wide but still a little disparate; given a third or fourth album to refine their sound even more and their praises will truly deserve singing. For the moment, this is a solid and even excellent round-up of various doom subgenres played with heart by a band with Khemmistry (hiyo!) that will appeal to any of my fellow gloombahs.